Born in Uwajima, Ehime prefecture. 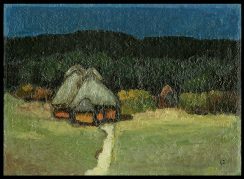 Studied painting by correspondence before moving to Tokyo in 1920. Forced to return to his parents’ home after the 1923 earthquake but returned to Tokyo in 1925 and obtained work in a government printing office where he began making prints by scratching on scraps of lead plate which he then inked and printed by using a teacup as a baren. Met Hiratsuka Un’ichi who urged him to exhibit with Nihon Sosaku-Hanga Kyokai. Largely self-taught as a printmaker but encouraged by Hiratsuka, Onchi Koshiro, and Maekawa Senpan for whom he worked from time to time as an artisan printer. 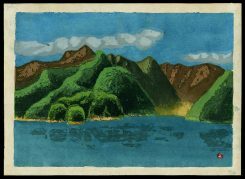 Exhibited with Nihon Sosaku-Hanga Kyokai from 1927, Shun’yokai from 1928, and Kokugakai from 1931. Member of Nihon Hanga Kyokai from 1932; member of Kokugakai from 1943. Contributed to Ichimokushu, Recollections of Tokyo (Tokyo kaiko zue), Kitsutsuki, Kitsutsuki hangashu, One Hundred Views of New Toyko (Shin Toyko hyakkei), Hosun hanga, Jissen hanga, and Han. Represented in Sao Paulo, Lugano, and Tokyo biennales. His prints in the late 1920s and 1930s, including numerous cityscapes and Ten Scenes of Iyo (Iyo jikkei) 1936 were strongly influenced by Hiratsuka Un’ichi. 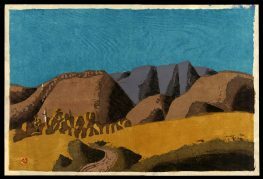 After World War II he developed highly individual prints of mountains and mountaineers with simplified forms and flat areas of color. Well known in Japan as an essayist on subjects related to mountains. ** Taken in whole, or in part, with permission from: Merritt, Helen and Nanako Yamada. Guide to Modern Japanese Woodblock Prints: 1900-1975. University of Hawaii Press: Honolulu. 1992.